The ancient and mystical runes of Celtic and European origin provide a rich source of inspiration for faery authority and fantasy artist Brian Froud's evocative paintings, which interpret these potent symbols through the prism of Elfland  the world of faeries and myth. In the hands of the exceptional folklorist and poet Ari Berk, the secret meanings of these runes are teased out and the power they offer us is made manifest. By using the runes and Froud's paintings as tools to explore both the "seen" and the "unseen" world, The Runes of Elfland will inspire readers to re-imagine their own lives and tell their own tales. 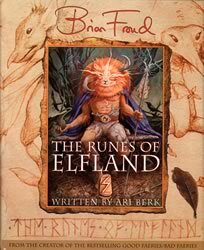 Both storybook and oracle, The Runes of Elfland provides a wellspring of personal insight for the Froud fan and the Faery aficionado. 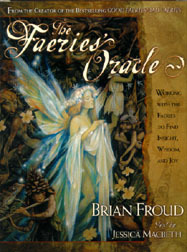 "Using the enchanted art of BRIAN FROUD as your guide, enter into the wise and wonderful world of the faeries. The Faeries Oracle calls on sylphs, pans, gnomes--and, of course, faeries--to lead you on a delightful journey of adventure, discovery, and enlightenment that will illuminate the future and heal the heart and soul. This beautifully designed divination set, with 66 radiant cards and an illustrated book, contains everything you will need to explore this mysterious realm." Brian Froud is an award-winning illustrator, author, and faery authority. His books include international bestsellers such as Faeries, with Alan Lee, Lady Cottington's Pressed Fairy Book, with Monty Python's Terry Jones, Lady Cottington's Fairy Album, and The Fairies Oracle. He also served as the conceptiual designer on Jim Henson's films, The Dark Crystal and Labyrinth. Froud lives in Devon, England, with his wife and son. Ari Berk is an artist, poet, and teacher of mythology, folklore, American Indian studies, and medieval literature. He has published works on rune lore, faerie stories, the Wild Hunt, landscape and myth, and many other topics. Dr. Berk is a professor of literature at Central Michigan University. Jessica Macbeth is the author of Moon over Water and Sun Over Mountain, two guides to meditation and self-discovery. She lives in California and Scotland.